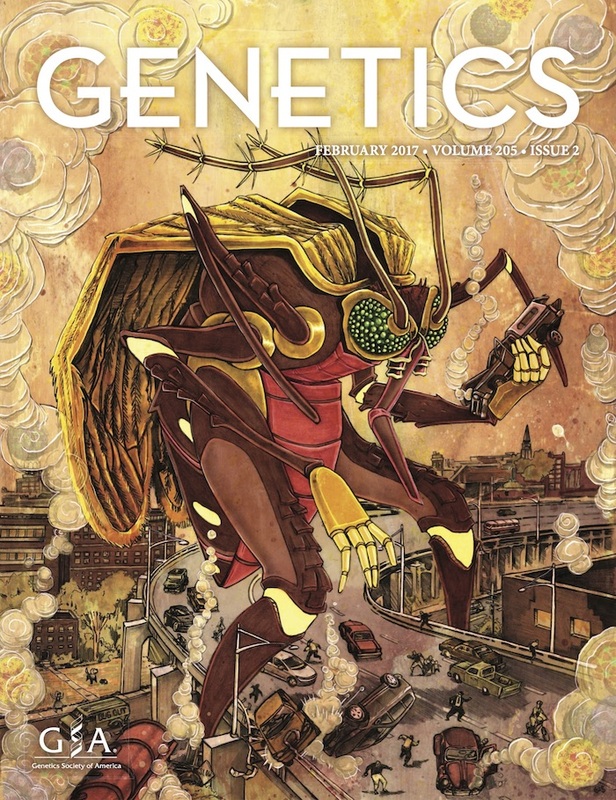 The February 2017 cover of GENETICS. When geneticist Rob Unckless took his son to Lego Club at the local library, he was not expecting to start a new collaboration. The result is the striking piece of science-inspired art that graces the cover of the February issue of GENETICS. Created by artist Kent Smith, “Attack of the 50 Foot Mosquito” was inspired by a paper by Unckless and his colleagues. The study examines a more subtle threat than a rampaging giant: the potential evolution of resistance to gene drives. Gene drives are a burgeoning new technology that use CRISPR-Cas9 genome editing to alter the genomes of an entire population. Cas9 is an enzyme that, when introduced into a cell, makes cuts in DNA that are then repaired through the endogenous homology-directed repair pathway. This repair process can be co-opted to change the final sequence; if a DNA sequence is introduced that carries the desired edit along with some homology to the cut DNA, it can serve as the template for repair. To turn this editing process into a gene drive, Cas9 and the guide RNA are also inserted permanently into the genome, so theoretically every heterozygote will automatically undergo this process. After the first transformation, the gene drive is self-propagating. This technology has been suggested as a way to control populations of disease vectors, like mosquitoes. Though this technology is exciting and new, selfish genetic elements are definitely not. There are a multitude of natural examples of elements that manipulate their way into more than half of an individual’s offspring. And notably, many of these natural driving elements are associated with genetic suppressors that prevent their selfish activity and restore equal transmission of both alleles. In their paper, Unckless and colleagues discuss potential mechanisms of resistance to gene drive, including new mutations and accidental by-products of the repair process involved in gene drive. They use mathematical modeling to show the probability that resistance spreads through the population is very much dependent on the frequency at which resistant alleles arise in the first place. This study shows much care and study is needed to more effectively use gene drives in the wild. This stunning cover was born when Unckless had just moved to Lawrence to begin an assistant professor position at the University of Kansas. He took his son to the Lego Club at the library; Kent Smith, a local artist who teaches in the School of Architecture and Design at KU and specializes in science fiction-inspired artwork, was also there with his son. “I struck up a conversation with Kent,” says Unckless, “We talked about what I do and what he does, and decided it would be fun to collaborate on something.” When the manuscript was accepted by GENETICS, they decided to do a piece to submit as a potential cover. “I loved being able to provide a fun visual for all of this amazing big brain science!” says Smith. “One of my favorite things about design and illustration is getting to research and learn about new subjects for each piece.” Unckless and Smith discussed what the paper showed about gene drives, and then Smith came up with a way to illustrate the evolution of resistance metaphorically. “Nature’s response to the gene drives comes in the form of a giant monster mosquito rampaging through a city,” he explains. 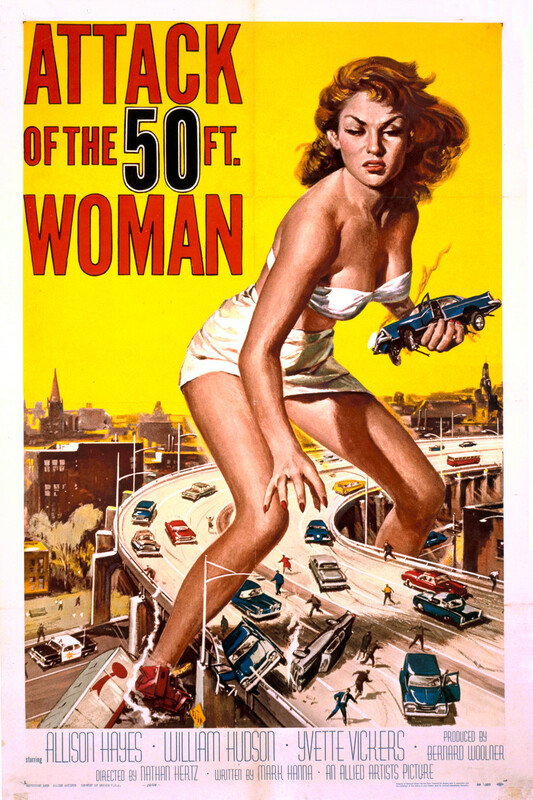 The piece is a reference to the iconic poster for the 1958 science fiction movie Attack of the 50 Foot Woman. Unckless saw rough sketches and gave suggestions about things like mosquito anatomy and the mosquito-borne Zika, dengue, chikungunya, and yellow fever viruses swirling in the clouds of smoke and destruction. A tiny Andy Clark can also be seen fleeing destruction on his bike. The final product of this meeting between art and science is a tongue-in-cheek commentary on the potential perils of gene drive gone awry. Though rampaging giants are unlikely to result, scientists should carefully consider the consequences of this potentially powerful technology.